In recent years, the demand for sweet potatoes in Norway has explosively grown, especially with young people. Norway imports around 80 tons of sweet potatoes per week, especially from the US. 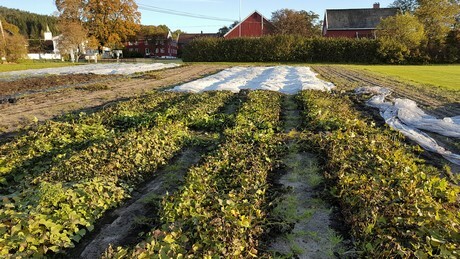 In the past two years,NIBIO Landvik has, together with family computer Bjertnæs & Hoel AS, done research into the possibilities to grow sweet potatoes locally. The project is financed by Grofondet, a fund established by Gartnerhallen SA, BAMA Eiendom AS and NorgesGruppen ASA.Erling Stubhaug, NIBIO: "The circumstances are favorable, particularly in places where early potatoes are grown." In the first season, the researchers tested four varieties. The potato plants are being imported from Israel, and tested for diseases and viruses. When planting, they use two different cutting techniques. To maximize the possible yield, it is important to plant the cuttings in spring. In the most favorable places, it should be possible to get a yield of six tons of potatoes per 10 are, of which 75% is saleable. In the coming year, the research will be continued with support of Grofondet.